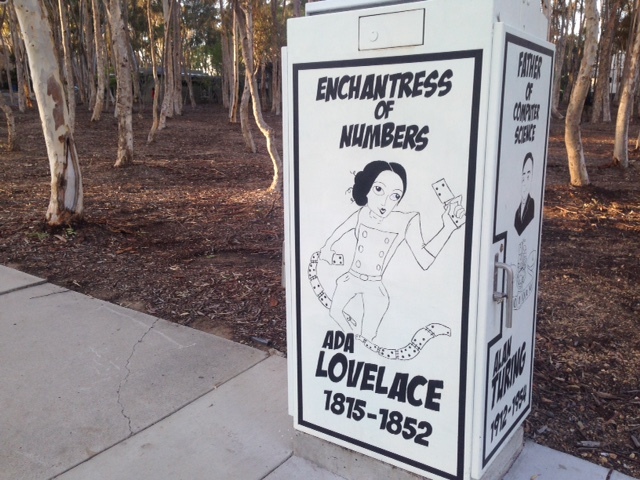 Nice to see Ada hanging around UC San Diego’s campus. “Instruction does much, but encouragement does everything.” These words were written by Goethe, but I know them from the email signature of my colleague Evan Misshula, a data scientist and criminal justice researcher with whom I worked closely on issues pertaining to software politics, social justice, and education at The CUNY Graduate Center. Evan is one of those magical people who has the unique talent of converting Luddites into free software advocates, poets into programmers, and underrepresented minorities into burgeoning computer science heroes. His success, however, is not just due to his ability to explain the harried details of computer technology to those who find it alienating or elitist, but to show them that computer science desperately needs their marginalized identities, interests, and values to contribute to its development if it is to ever fulfill its promise. I mention Evan here because his approach is emblematic of the collaborative and ethically-minded digital humanities and digital pedagogy community at The CUNY Graduate Center that I’ve had the honor of helping build as a Digital Fellow and Mellon Interdisciplinary Science Studies Fellow for the past four-and-a-half years. Through this experience I have witnessed the transformative power of encouragement at personal, collective, and institutional levels, and it is this power which I would like to keep fresh in mind as I announce my exciting new transition. I am delighted to say that I am joining UC San Diego’s Center for the Humanities as the Associate Director and Digital Humanities Coordinator. It is not easy to say goodbye to the many generous, creative, and innovative individuals which inspired and challenged me daily at The Graduate Center and the greater New York City area; from them I have learned that the power to make change rests directly in our ability to encourage the people immediately around us. In just the few short years that I spent at The Graduate Center, I had the privilege of either participating in or witnessing tremendous change in the development of multiple extraordinary initiatives including the GC Digital Scholars Lab, the Digital Praxis Program, Manifold Scholarship, DH Box, and The Futures Initiative, while also collaborating on a wide array of DH projects and teaching DH workshops. I must, of course, give special due to The Digital Fellows program, The CUNY Academic Commons, and The Interactive Technology and Pedagogy program. These initiatives not only completely transformed my scholarly direction but also made it possible for me to conceive of and lead Social Paper, a non-proprietary socialized writing environment for students that has received a National Endowment for the Humanities Digital Start-Up Grant and a CUNY Advance Grant. In my own view, part of what has made The Graduate Center so tremendously rich in digital innovation is the encouragement they have given to students to help lead the charge. While I will miss The Graduate Center dearly, I am thrilled to join the vibrant, multidisciplinary community of UC San Diego. It is an exceptionally exciting time to arrive as recently-appointed Dean of the Division of Arts and Humanities Cristina Della Coletta is actively building out new initiatives to foster forms of interdisciplinary and public-facing scholarship. As Associate Director and Digital Humanities Coordinator for the Center, I will help shape these ongoing efforts in building bridges across disciplines, institutions, and publics in order to amplify the reach of UC San Diego’s thriving intellectual and pedagogical activities. At the Center, I will continue my research and advocacy in critical digital pedagogy and am eager to collaborate with the broader San Diego and Souther California DH community whose regional networking initiatives I’ve been enthusiastically following from afar. It is a great honor to join these many flourishing communities in the important work of encouraging and carrying out new imaginative possibilities for scholars, students, and the broader public.